This was a victory by a combined American and French force led by General George Washington, the Marquis de Lafayette, and the French General Comte de Rochambeau over a British army commanded by General Lord Charles Cornwallis. Admiral de Grasse with the French battle fleet of twenty-eight ships defeated Admiral Thomas Graves British fleet in the Battle of the Chesapeake, cutting off Cornwallis from reinforcements and supplies. On September 28, Washington and Rochambeau, along with Lafayette's troops and 3,000 of de Grasse's men, arrived at Yorktown. In all about 17,000 men lay siege to Cornwallis' camp. The city was soon surrounded and under heavy fire. 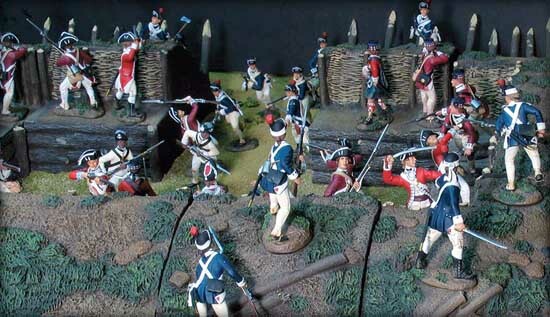 After 3 weeks of siege, on October 14, the Franco-American forces captured two major British redoubts. On October 19, he officially surrendered. About 7,000 British troops became prisoners to the American forces. The surrender of Cornwallis's army caused the British government to negotiate an end to the American Revolutionary War.